The Vanishing Pen trick, this is a great trick to practice in front of the mirror before attempting to WOW your audience. This trick is really one of those tricks that you can only do once and then move on to your next trick as if you repeat it your audience is likely to work it out pretty quickly what you are up too. As the Magician says, keep it simple and make sure you do a bit of acting with it to increase the effect and showmanship of the trick. 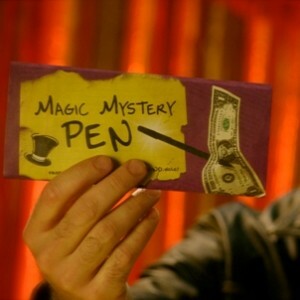 The Magic Mystery Pen is an ordinary looking black pen with a secret gimmick. The performance is simple and easy to do. First show the pen and a dollar bill. Show the pen to penetrate the bill. Then magically remove the pen from the bill leaving no hole or blemishes. Hand both the pen and the bill out for total examination! Makes for a great everyday pen also.